Tuesday 4 4 easy with strides at the end. Felt tired. In terms of volume, this was one of the lightest weeks I've had in a while. I didn't run Sunday, instead opting for a hike. If I included the hike's mileage into the weekly total, it does bring it up (it is good cross training in my opinion). I finally broke down and made a doctor's appointment for this coming Thursday (thanks to all the people that have been nagging me to do). I've been feeling drained for longer than I should. Perhaps it is because I am on the go a lot and have a few life stressors, but I still feel something more is amiss. Looking back at my times over the years, I've noticed that they are declining rapidly and in my opinion, no reason (other than age and living at altitude). Hopefully I can get to the bottom of it. I've noticed that this feeling happens more often than not midweek. Perhaps it is the Wednesday "blahs" but it seems a bit more serious and if it is something medical related, I prefer to deal with it rather than feel like I am dragging an anchor. I've been talking about going to the doctors since last fall; like a typical guy I don't like going to the doctors unless I really have to. With a race coming up this weekend, I am looking at doing my long run early in the week. I want to keep up a 13 - 15 mile distance so once I return from vacation in late August I'll be able to resume marathon training. I am still on fence about whether I will do another full marathon before the Las Vegas one but whatever I decide I want to be ready. Some hazy plans: Race to the Angel half marathon in mid September in Wells, Ely Half Marathon late September, Oct Marathon (? ), Las Vegas Marathon, full Phoenix RnR marathon in January. Next weekend I am running the Sandy Utah Midnight Moon 5K. This is a Friday night race and I did it last year. It was a good race and another night event, so there should be cooler temperatures. Also it is pretty cheap, going for $20. 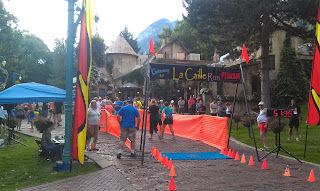 I snapped this photo of the finish line at the Gateway to La Caille 7K race. I had already finished and went back and got my camera. Definitely will do this race next year.